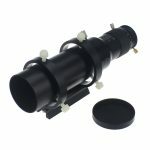 If it seems familiar, that’s because it is identical to the Orion 50mm mini guider (including all the accessories that come with the Orion). In fact, my unit came marked as “Starguider”, which is how Agena brands their own version, and there is also a TS (Teleskop-Service) version. The optics look good and construction is metal except the 3 adjustment screws, but relatively light at 496g including the stand which fits snuggly on the usual skywatcher/celestron etc finder-scope shoe (a shoe is also included if don’t have one). Focusing is a bit awkward: you focus roughly by manually sliding your camera into the tube as much as required and tightening (you can attach the provided parfocal ring to not have to repeat this) and then you can adjust a bit by rotating the front part which can move the objective by a few mm. Due to this limited focus travel, to focus with an eyepiece (i.e. to use this as a regular finderscope) you need a small extension. I also tried a 1.25″ diagonal, but that added too much distance so I could not get focus with an eyepiece, so you are quite limited if you expected to swap the camera with an eyepiece now and then. I don’t see a way to remove the guide scope from the holding bracket (in case you wanted to upgrade the bracket or the scope) and the 3 adjustment screws provide very little travel, although I doubt you’d have a problem finding a guide star with a decent guide camera. 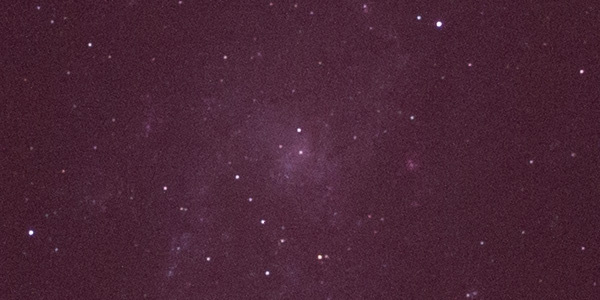 The specs claim 162mm f/3.2, however plate-solving with a QHY5L-IIm camera gave me 183mm. This is actually a bit more useful, as at f/3.66 it is still really fast, but the extra focal length is welcome. Where to buy: Right now I see the Solomark out of stock, but you can get the Orion version at a decent price from Amazon.com or Amazon.co.uk. There is also the StarGuider version on ebay.com. Right from the start, I liked the smooth, graded helical focuser that makes focusing very easy, a big advantage over models without one. 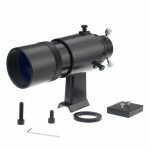 In fact, apart from the helical focusing travel, the focuser has a telescoping drawtube (also graded) which allows you to reach focus easily even with an eyepiece – no need for an extension. Some people claim helical focusers can add flexure, so we’ll have to see about that. The optics look good (real 50mmm unobstructed aperture) and the build is solid, even the front cap is metal (no focuser cap though, strangely), except the nylon screws – although it seems quite sturdy I have heard some cases where nylon screws added flexure, so that’s an additional concern. The total weight of base & optical assembly is 590g. Now there is a small issue with the dovetail. While you’d expect it to be the same size as the usual finderscope base, it is, in fact, a few mm thinner. This has the effect that some bases with relatively short screws (e.g. 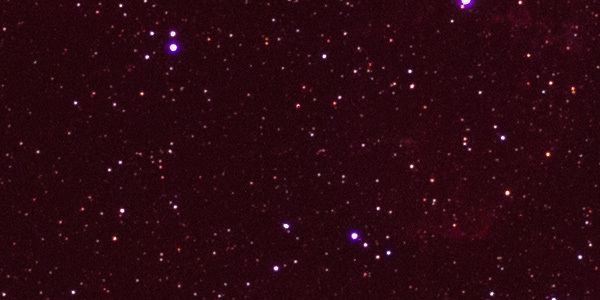 the standard finder shoe on the SkyWatcher Evostar 80ED) can’t reach it to secure it. A longer screw fixes the problem (and some shoes, like the one on my SkyWatcher 130PDS, don’t have an issue to begin with). The specs claim “190mm f/3.4” (which does not exactly compute with a 50mm aperture), and plate-solving with a QHY5L-IIm camera gave me a close enough value of 182mm focal length, which makes it a very fast f3.64. There is also an “F60” model, which is the 60mm version. Where to buy: You can get the F50 on Amazon.com or Amazon.co.uk. You can get cheaper unbranded versions from China on Ebay, although I can’t vouch for any specific seller. You might be tempted to also look at the larger F60 at Amazon.com or Amazon.co.uk, although I haven’t tried it myself. Mini guide scope top, F50 middle, Celestron 9×50 botton. I tried both with a 20mm eyepiece and they performed similar to a classic 9×50 finder, while I didn’t do a very careful comparison, there was no excessive CA or anything distracting like that, so you should expect to use them as a finder as well if you like. As I explained though, the Mini guide scope has some trouble achieving focus with an eyepiece, so if you swap out the camera you need an extension plus eyepiece. The F50 with its helical focuser and telescoping drawtube has a range that can accommodate cameras and eyepieces. More importantly, it takes a few seconds to find exact focus and there are screws to lock it. With the Mini Guide scope focus is rather cumbersome. Theoretically, you slide your camera (or eyepiece) in/out and you lock it at a rough focus, then use the objective ring to achieve fine focus. 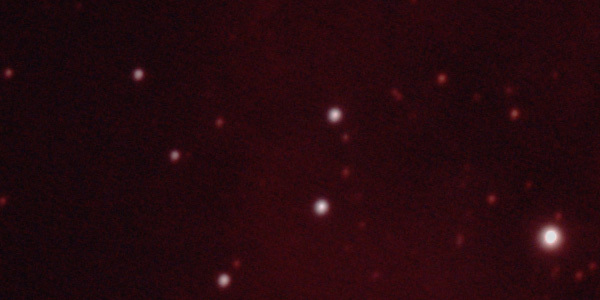 As the objective ring is much less smooth than a helical focuser and changes focus very slowly, it does take some effort. 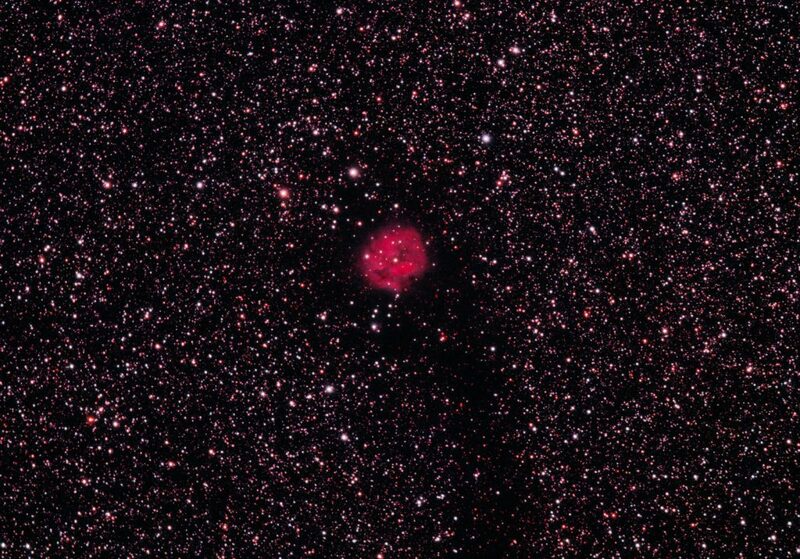 That’s why you are given a parfocal ring, hopefully you can fit it on your camera and not have to focus it again. I can see how it would not be that much of a problem if it gave me more stability (i.e. was less prone to flexure), and the apparent popularity of the Mini Guide Scope (at least the Orion version) seem to indicate that many users don’t really mind. On to actual guiding. Both these Guide Scopes are around f/3.6. 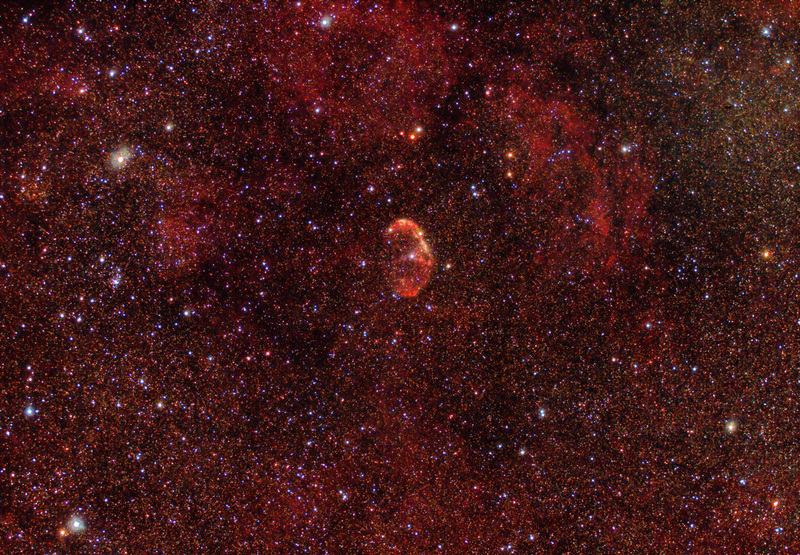 With modern sensitive guide cams, this means that wherever you point your scope there are always bright enough stars for guiding, without any additional effort. In fact, with my QHY5L-II mono, I usually had at least one star bright enough to work with a 0.1s exposure and very seldom has it seemed marginal enough to warrant 0.2s. If you are planning to use something like a webcam though, you might appreciate the fact that the F50 gives you a lot of movement via its nylon screws, so you can change the aim of the guide-scope as you wish. The nylon screws don’t seem particularly stiff which was a worry for me initially, but I did try to screw them very tightly to avoid any possible flexure as much as I could. 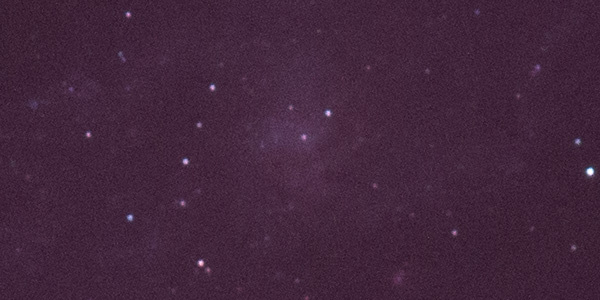 In any case, I had absolutely no trouble setting up a guiding session with Phd2 for 5 minute exposures with my iOptron ZEQ25. Guiding was with a QHY5L-II mono (3.75μm pixel size) and imaging with a Canon 600D mod (4.3μm pixel size). Let’s have a look at the results. So, at least at these focal lengths, the nylon screws and convenient helical focuser of the F50 guide scope don’t seem to give it a disadvantage in regards to flexure. You might have noticed that most of the images above are using the F50 helical focuser guide scope. Indeed at some point I stopped trying to compare them and started using the F50 exclusively, since it only had advantages. Mainly, it allowed me to quickly change between an eyepiece and a guide camera, which was useful when switching OTAs. There were no problems (e.g. flexure) that I could detect with either guide scope, especially at 600mm or lower focal lengths which are the most common usage cases for such guide scopes. I can see why some sellers or manufacturers might claim they are good for up to 1500mm, as I did end up using them at such focal lengths with my test setup, but it was a setup not intended for imaging at such focal lengths, so the exact precision of the guiding at 1500mm cannot be evaluated. 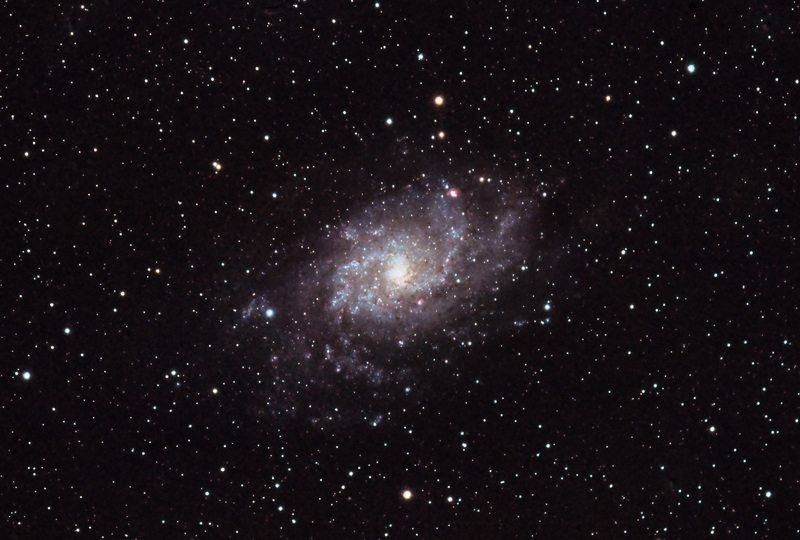 Realistically, if you are serious about guiding at over 1000-1500mm and you don’t have huge pixels on your imager, I suggest you go for a guide scope at around 250-400mm to be safe. 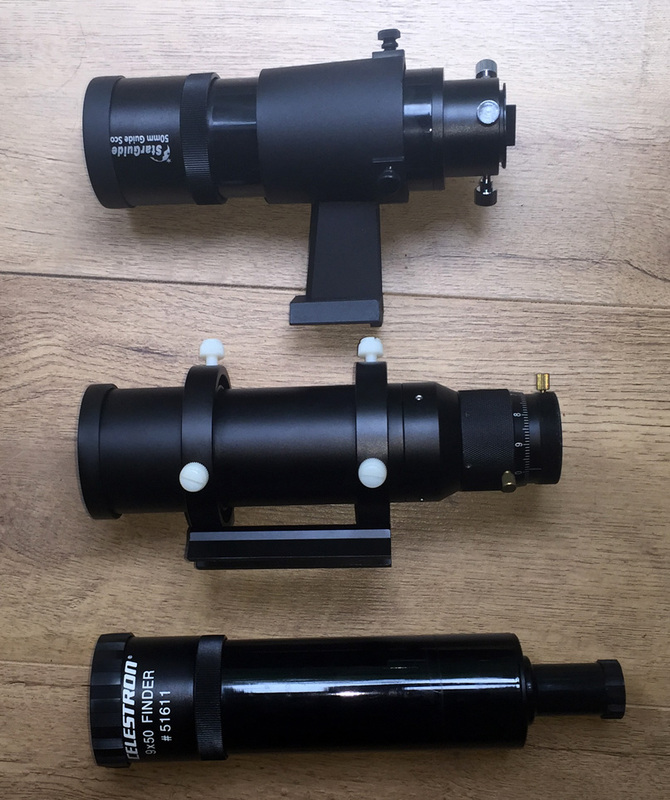 However, with OTAs up to around 1000mm, these 50mm guiders are recommended, as they are much easier to setup than having to deal with the protruding prisms and guide star-finding issues of OAGs, and it doesn’t seem to me that you have to spend more for some branded versions that have much higher prices. 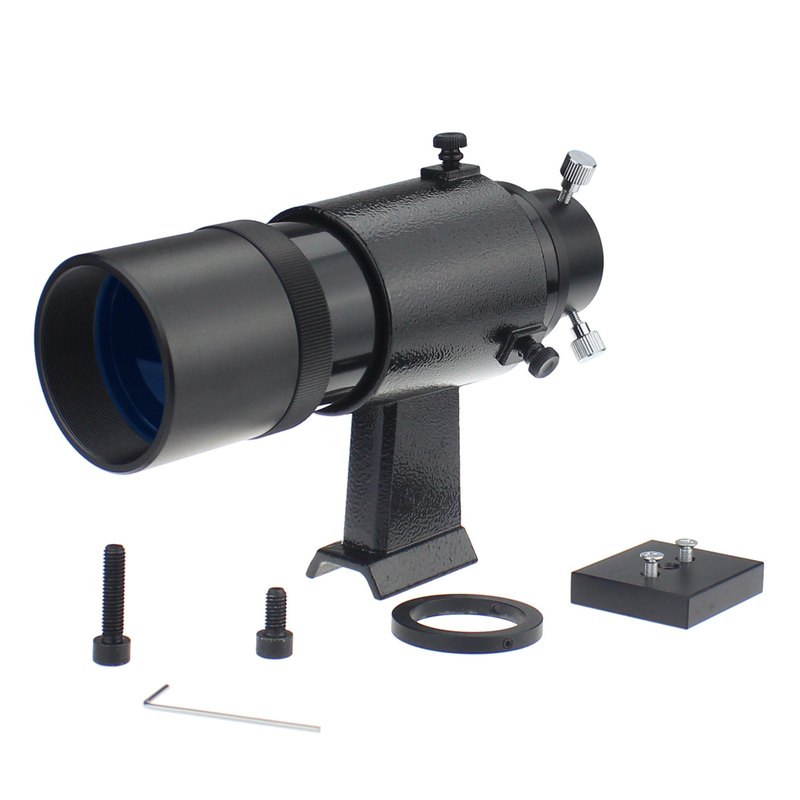 Long story short: I want to purchase a clone of the ‘Solomark F50 Guidescope’ you described above (the ‘Datyson 50mm Guide Scope’) and I want to attach it to a side-by-side dovetail base, along with (for example) a DSLR. I am confused by the different types of dovetail mounts that are used by astronomical equipment. Typical ‘finderscope’ ones seem be 24mm top/36mm bottom widths (is the Solomark F50 like this?) but the dovetail bar at the bottom of my Celestron C90 uses the Vixen (?) 36mm top/44mm bottom widths. Thanks for any advise and info you can provide! Sorry, I was on vacation. 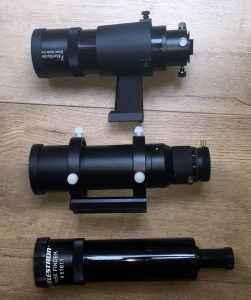 In case you haven’t figured it out, you are right, the telescope dovetails (the Vixen is the smallest and most common in small scopes/mounts) are indeed larger than the finderscope dovetails and the usual dual saddles you will find are for those. The F50 is 30mm at the widest point (bottom), so it cannot go into such a saddle directly. However, the dovetail of the finderscope unscrews from the rings so theoretically you could screw it to an appropriate vixen dovetail. That seems to be the best solution to your problem. Of course, you still need to make sure the side by side saddle you buy accepts vixen and not something else!